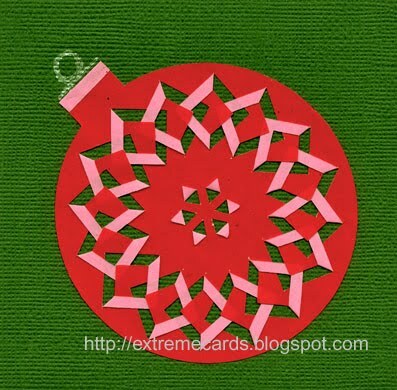 I made this card using a technique variously called incire, cut and fold, lacé or cut 'n tuc. You can buy brass or plastic stencils to cut these designs, but I just drew a cutting file for my Craft Robo cutter from a picture. I haven't found a good, comprehensive, set of instructions online. Print resources are scanty, too, but I did dig up these two. It's pretty self-evident what to do: cut the cut lines, then fold the cut-outs shapes and tuck under the one before it.